Catholic Christianity reached India in AD 52 when Thomas the Apostle reached the Malabar Coast. These Saint Thomas Christians are known as Nasrani, which is a Syriac term meaning Follower of the Nazarene Jesus. 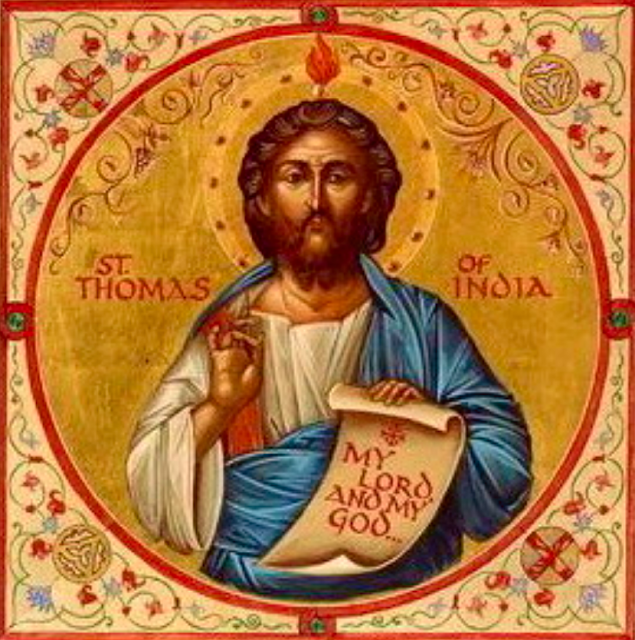 St.Thomas, one of the 12 Apostles, who traveled after the Pentecostal experience, to the farthest country then known to proclaim the Good News. In some of their traditional liturgies they still retain Syriac, which is a dialect of Aramaic, the language that Jesus spoke. St. Thomas set sail to India and landed in Kodungalloor, Kerala in 52 A.D. He preached in different kingdoms all around the Subcontinent and established seven and a half Ecclesial Communities in Malabar, today called Kerala. After 20 years of His mission work, He was martyred at Little Mount near Mylapore, by a fanatic Hindu priest on July 3rd in AD 72. The whole world celebrates the Martyrdom of St.Thomas on July 3rd and it is a day of obligation for the Syro Malabarians. The Church of the St. Thomas Christians had little contact with the Roman or the other Churches within the Empire. At the same time it maintained communion with the Church of Rome through the Church in the Persian Empire, which later came to be known as the East Syrian or Chaldean or Babylonian Church. It is believed that Christianity in Persian Empire was introduced by the disciples of St. Thomas. The arrival of another Thomas (Kynai Thomman) and several Persian families from Cana in 345 AD founded a settlement of Christians in Kottayam, at the behest of the Catholicos of the Assyrian Church of the East. Then the church began to be ruled by East Syrian (Chaldean) bishops. The descendants of this group are called Knananites or Southists. The Indian church however, did not join the East-Syrian Church or priests from India were not made bishops. For some unknown reasons at least from the 8th century until the end of the 16th century the Bishops of the Syro-Malabar Church were sent from the East Syrian Church, appointed by the Patriarch of the East Syrian Church. With the arrival of the Portuguese explorer, Vasco De Gama to Calicut on the Kerala Coast in 1498 AD, a Latin connection began to take shape. The Portugese were happy to discover the St.Thomas Christians on the West coast of India in the midst of Hindus and Muslims. (It is noted that the Portuguese burned ancient original Church historical documents of the Syro-Malabar Church that were in Aramaic and Syriac) The Portuguese soon noticed the differences in liturgy and the connection to East-Syrian Church; they alleged that St.Thomas Christians believed in the Nestorian Heresy as they accepted Bishops from the East Syrian Church which officially had adopted Nestorianism. The fact, however, was not so. The Syro-Malabarians had never accepted Nestorianism even though they had contact with the East Syrians and they were not at all involved in any of the Christological controversies. As they were living at a time soon after the council of Trent in which decision was taken to deal toughly with heretics, they were all out to "reduce the Syro-Malabarians to the Roman obedience." There were also the commercial interests of the Portuguese behind the appointment of Latin Bishops to rule the Syro-Malabarians. As the last Bishop appointed by the East Syrian Patriarch died in 1597 the Portuguese tightened their hold on the Syro-Malabarians and never permitted any more East Syrian Bishops to enter Malabar. The Synod of Diamper (Udayamperur) in 1599 convened by the Latin Archbishop Menezes of Goa thus brought an end to the connection between St.Thomas Christians and East-Syrian Church; it converted St Thomas Christians into a branch of the Latin Church and under Padroado, the colonial power of the Portuguese, making its people accept many customs with which they were not familiar. He also spread the news in Europe that Syro-Malabarians were "reduced to the Roman obedience" and accepted Catholicism as well the authority of the Pope in this Synod. On the contrary, whenever they got a chance they reiterated their allegiance to the Pope and their communion with the Church of Rome. In any case, the rule of the Latin Bishops was never accepted by the Syro-Malabarians and the climax of their protest was what is known in the history as Coonan Cross Oath. The leadership of the St.Thomas Christian community pledged in this oath not to accept any more the rule of the Jesuit missionaries from among whom the Bishops were appointed. The Coonan Cross Oath in 1653 at the Church of Our Lady of Life in Mattanchery was the culmination of several years of latinization by the Portuguese, and the crowd gathered there took an oath that they would not be subject to the Portuguese Archbishop of Goa, Francis Garcia. St. Thomas Christians who gathered under the leadership of the Archdeacon to receive a Bishop from Persia, took the oath touching the cross there that they would not obey any more the Jesuits who were the main European Missionaries in India at that time; Coonan Cross Oath was a revolt against the oppressive rule of the Europeans and not against the Pope or the Holy See. After the Oath 12 priests at the instigation of one of them laid hands on the head of the Archdeacon and "ordained him Bishop". There began the division in the Church of the St.Thomas Christians into two major groups: one group continued to recognize the prelates appointed by Rome and the other which broke away from Rome and joined the West-Syrian Jacobite Church of Antioch. This group came to be known as the Jacobites (Puthankootukar) or Syrian Orthodox Church of India. The Marthomites separated from the Jacobites in the 19th century due to Anglican Church influence. The Jacobites were further divided into two groups: Methran Kakshi or the Bishop's group (Syrian Orthodox Church of India) whose Catholicos or supreme head resides at Devalokam, Kottayam and the Bhava Kakshi or Patriarch's Group (Jacobite Syrian Orthodox Church of India) whose head is the Antiochene Jacobite Patriach. After the Coonan Cross Oath, Rome began to take an active interest in the Kerala Christians. Pope Alexander VII sent some Italian Carmelite Vicar Apostolics to Malabar in 1656, and the Portuguese jurisdiction to the Propaganda Congregation was introduced in Malabar by 1661. Thus St Thomas Christians were placed under dual jurisdiction, under Padroado and PropagandaCongregation which was of concern to Rome. This continued until the 18th century, when Fr. Joseph Kariattil and Fr. Thomas Paremmakkal, two priests from the Church of St.Thomas Christians, went to Rome for mending the situation. Fr.Kariattil was ordained Archbishop of all the St.Thomas Christians, who owed allegiance to Rome after the Coonan Cross Oath; but he died in Goa, on his way to Kerala in 1786. In 1787, representatives from 84 churches assembled in Angamaly and drew up a document called Angamaly Padiyola which made a strong demand to Rome for native bishops, citing the sins of omission and commission of the foreign missionaries. The Holy See suppressed the PadroadoSees of Cranganore and Cochin in 1838 and all the faithful of these suppressed sees were entrusted to the Vicar Apostolic of Malabar (under the Propaganda) who used to reside at Verapoly. In 1861, the arrival of a Chaldean Catholic bishop, Thomas Rokkos sent by the Chaldean patriach created more problems. He was excommunicated on his arrival by the Vicar apostolic of Varapuzha, and a schism followed. Another Chaldean bishop, Elias Melus arrived in 1874 and he too met the same fate. The Syrian Christians, popularly known as the Surais, in and around Thrissur who owe allegiance to the Syrian Nestorian patriarch are the followers of the schism Melus created. It was only in 1886, the Padroado jurisdiction over whole Malabar was suppressed and a Latin hierarchy was established. The very next year, in 1887, Pope Leo XIII finally decreed the separation of Rite of St.Thomas Catholics from that of the Latin Catholics. Two Vicariates apostolic, at Thrissur and Kottayam with two Latin Bishops, Adolf Medlycott and Charles Levigne were erected by the Papal Brief Quod iampridem from Rome. But the Vicars Apostolic appointed for them were foreigners and of the Latin Rite. These Apostolic Vicars would then choose from the Syro-Malabar clergy, a Vicar General each to whom are given special faculties and privileges. The Knanaya Christians who were the endogamous “ purists” came under the Vicariate of Kottayam, and Bishop Lavingne appointed Msgr. Mathew Makil the Vicar General of Knanaya Catholics in 1889. Continued pleas for native bishops in Malabar finally resulted in Pope Leo XIII ‘s Brief Quae rei sacrae (1896), the two Vicariates were reorganized into the three Vicariates of Changanacherry, Ernakulam and Trichur, and the Syro-Malabar Church received Vicars Apostolic of its own rite: Thrissur, Ernakulam and Changanassery under Indian Bishops John Menachery, Louis Pazheparambil and Mathew Makil respectively. The Knanite Catholics of Kottayam then became the part of the Apostolic Vicariate of Changanachery, headed by Bishop Mathew Makil, a member of Knanaya Community itself. With the efforts of Bishop Makil, Pope Pius X with the Decree, "In Universi Christiani" on 29th August 1911, erected a fourth vicariate at Kottayam, exclusively for the Southists or Knanites . Knanaya Catholic Bishop of Kottayam has presently got jurisdiction over all the Kananaya faithful within the provinces of Ernakulam , Changanacherry, Trichur and Tellicherry. The auxiliary bishop of Kottayam as Syncellus or representative of the Bishop of Kottayam resides at Kannur in Northern Kerala and looks after the needs of the Kananaya faithful in the Northern Kerala. On December 21, 1923 the Syro-Malabar Hierarchy was established by the Apostolic Constitution Romani Pontifices of Pope Pius XI (Acta Apostolicae Sedis, 16, pp. 257-262). Later in the year 1930, a group of Coonan Oath dissidents under the leadership of their archbishop called Mar Ivanios reestablished their lost communion with the Roman Catholic Church and the Holy See accepted it as a separate Catholic Church with the name of Syro-Malankara Church. Since 1950 the Church began to grow out of its base in central Kerala and dioceses were extended to the State's southern and northern parts. From 1962, the Church began to set up mission centers in Northern India, which later became dioceses. The first diocese (suffragan) outside Kerala was Chanda, in Central India, in 1977 and the first diocese (mission) abroad in Chicago in 2001. The Syro-Malabar dioceses that are located outside Kerala are suffragans of Latin archdiocese in each area, except the Mission Diocese in Chicago which is directly under the Holy See. Ever since the East-Syrian Church began to exercise control over the Indian Christians, the Malabar Church became Syrian in rite with “Syriac” (Aramaic) as the ecclesiastical language. The name “Syro-Malabar” is coined from the words, Syriac and Malabar (now Kerala). The name came into force after it began to be used by the Holy See in its documents from the time indigenous bishops were first appointed in the Church towards the end of the 19th century. Those faithful who remained in communion of Pope after the Coonan Cross Oath later were referred to as the Syro-Malabarian Christians, the name apparently to avoid confusion with the Malabar rite which existed as a part of the Latin Church in the Coromandel coast of India. The Syro-Malabar Church however has always been in communion with Rome, the See of St. Peter and his successors. Syro-Malabar Catholic Church is an Apostolic Church of long history, as old as Christianity itself.